HealthSTART® is an in-store sampling program that provides a unique opportunity to intercept health-conscious consumers in food, drug and mass merchandiser channels through retail-based pharmacies and in-store health clinics. Retail pharmacies and their pharmacists are playing an increasingly prominent role in early preventive care, providing health screenings, and health education, in addition to the traditional role of serving as a trusted and approachable health authority at the time of medication delivery. Likewise, health clinics in retail settings are rapidly becoming a key provider of low-cost, convenient healthcare services. View an NBC Today Show excerpt about the emergence of retail-based clinics, and the growing role they are playing. 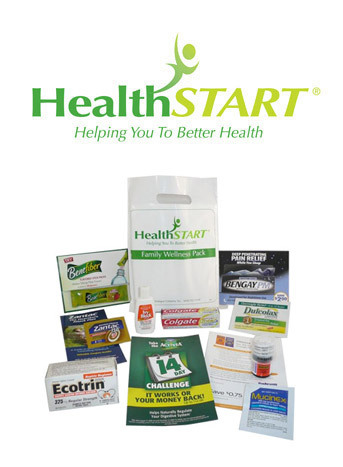 HealthSTART is hand-delivered by these healthcare professionals in the form of gift kits that include relevant product samples, coupons, promotional offers and health education materials. HealthSTART combines a turnkey delivery vehicle with a proprietary retail distribution network, to intercept health-conscious consumers and their families, precisely when they are seeking information about healthier lifestyles, and better-for-you products. For more details view our Media Kit.